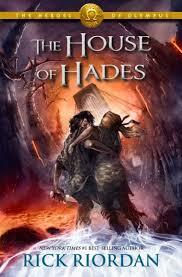 In House of Hades, by Rick Riordan, all of the mythological stories you have heard, come to life. In this adventurous story, demigods join forces to stop the wickedly evil Gaea, the earth god, from taking over the Earth. The youthful kids go through fear, passion, hope, friendship, and horrible tragedy along their twisting rollercoaster of a journey. Humorous at times and moving almost to the point of tears at others. There are seven main characters and two minor characters. The main characters are Percy Jackson, Frank Zhang, Annabeth, Hazel, Jason, Piper, and Leo. The two side characters are Nico Di Angelo and Coach Hedge. Hedge is a satyr and Nico Di Angelo is the son of Hades. A satyr is a half human half goat creature with the upper half being human and lower half goat. This group of misfits travel to many places but two of the main settings are in Greece and Bologna. The gang are on a journey to save Percy and Annabeth from Tartarus, a pit in the underworld, to close the Doors of Death, and stop the Romans from attacking Camp Half-Blood. They are closing the Doors of Death to stop the giants from raising Gaea, but Leo starts to wonder how Percy and Annabeth will get out if the doors are closed. They encounter many obstacles on their journey such as being raided by Kerkopes, Passalos, and Akmon in Bologna. The antagonists want to take Archimedes sphere that Leo found in Rome. They travel aboard a flying warship built by Leo, as he is the son of the inventor god, Hephaestus. Although I am not a immense lover of mythology, I found this one of the best books I’ve ever read. Riordan’s descriptive word choice and his unique writing style, never let me put the book down. Most of the book felt like he had reached his hand out of the book grabbed my shirt, and pulled me in to see the Argo II and the all the demigods in battle. I feel like anyone under eighteen would love this, but it might be too long for younger kids. The reading would be so lengthy that they could never get pulled in to the book like I was. This book was very exciting and I loved every minute of it.